MEEKER I Meeker opened up their final regular season game against Rangely on Friday, Feb. 22, starting the five senior varsity players. Bailey Atwood, Kaysyn Chintala, Kacey Collins, Katie Dinwiddie and Amanda Kendall also closed the Cowboy win that earned the team a second place spot in the league. Head coach Greg Chintala noted that the team “showed a lot of poise” in the way they handled a closer scoring game. Rangely hit the opening shot of the game then Atwood sank a bucket for Meeker. The Panthers quickly added four more points to their side of the board, but those would be their last points for the quarter. Piper Haney hit the floor and added two points for Meeker. The Lady Cowboys then turned up the heat on their tenacious press and with a few Panther turnovers and quick offense, Aly Ridings and Taylor Neilson drained a three pointer each. Neilson, Ridings and Sydney Hughes topped off the quarter with six more Cowboy points to lead 16-6. The Panthers found the bucket again early in the second quarter adding six to the board, but Deena Norell dished in two jumpers to keep the Cowboy lead. Rangely answered with four more points then Neilson added a foul shot, 21-15 Meeker at the halftime buzzer. With a spark the Panthers jumped ahead by one point early in the third quarter, but they fouled Haney who drained both shots. Then Dinwiddie and Kaysyn Chintala found the bucket to add to the lady Cowboy lead. Rangley nailed a two on a fast break, but Norell sank a three to end the quarter 36-29, Meeker. The Lady Cowboys continued to build their lead for a 51-40 finish. Neilson led the scoring with 13 points, Ridings cashed in 12, Norell added seven, Chintala, Dinwiddie, Haney and Hughes cashed in four each, Atwood sank a bucket and senior Amanda Kendall drained a free throw. Immediately following the game, Meeker took a moment for some very important awards. The girls’ varsity seniors, along with Anna George and Nicole Hilkey, senior co-captains on the junior varsity team, thanked fans and family for their support while handing out candy, flowers and gifts. Then the senior basketball boys also thanked their families. The Yampa Valley Basketball Officials Association presented Meeker’s Kaysyn Chintala with the 2012-2013 Sportsmanship Award. The officials who represent this association referee games in Steamboat, Soroco, Hayden, Moffat County and Meeker. At the end of regular season play, these officials vote for one senior boy and one senior girl who exemplify outstanding sportsmanship, leadership and character on and off the floor. Mark Doolin of Hayden was chosen to receive the boys’ plaque. To conclude the honors ceremony, Meeker boys’ head basketball coach Klark Kindler was awarded for his 200th career win. 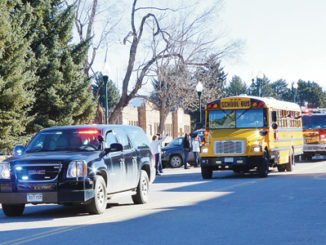 Kindler racked up this win in the game against Vail Mountain on Feb. 9. Meeker won the pigtail match against West Grand Tuesday, 82-21 to qualify for the District 1 tournament. 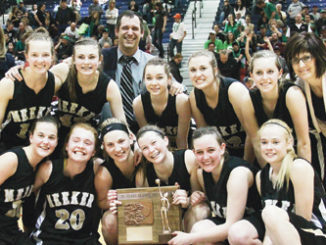 MEEKER I The seniors on the Meeker girls’ basketball team ended their high school basketball careers with a win Saturday, finishing in third place in the 2014 Colorado State Basketball Championships.